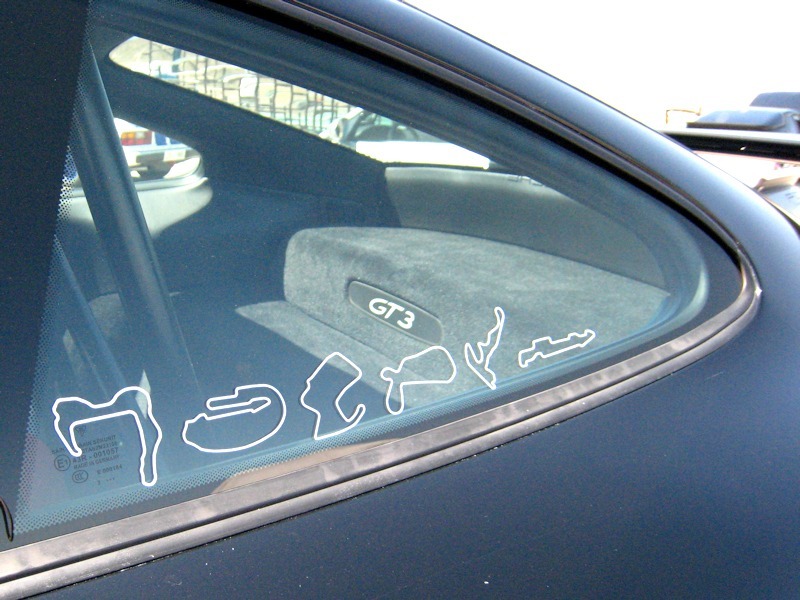 I've noticed a lot of people have stickers on their car that have the track layout of Barber, Road Atlanta, etc. I'd like to get a couple of these but haven't had any luck finding them? Any one know where I can an such an animal? Not sure if there are other resources, no affiliation. They have tons of tracks and customer service is great! Yeah those are cool... have been looking for some of those for a while now. Saw a few in one of the merch trailers last year when Champ Car was here in PDX. The TrackGraphic ones are a little small though... but they do look good when lined up on the rear quarter windows I guess. These are from TrackGraphic, I've gotten a lot of compliments on them. I have also been asked, "is that some Star Trek Klingon language?" and "is that Egyptian?". I love them mostly because every time I get into the car they make me think of a track day. Apologies for the poor picture quality. The list that I have is in this catalog. I can do a variety of colors and can scale to whatever you need. If you want a track that you don't see here, let me know and we'll draw it up for you. Dr J's are good stuff. I have them both on my car (the tracks that it has seen), as well as one of my helmets (the tracks that I have driven). Anyone up for some back seat driving?